Sundance 2009 Day 0: Welcome Home to Park City! I've returned. I'm here in Park City, Utah and I feel like I'm home again. I'm only here for another 12 days, but it feels like I'm back where I belong. I love Sundance. It's plain and simple, I just love it. Our writer Marco described it best once in saying that it's like Disneyland for film geeks. If you ever went to Disneyland as a kid, then you know how ridiculously exciting that was for you at the time. Sundance is pretty much the same thing, per se, but for grown-ups who love film. It's my third year here and it's time to kick off the festival, ride the rides, see plenty of films, and give you the best coverage of Sundance that I can. Given the festival doesn't actually start until later tonight (meaning Thursday), not too much has really happened, although there is still plenty to talk about. I got some extra sleep and woke up late, then ran to Starbucks with Peter Sciretta from SlashFilm and Neil Miller from Film School Rejects (watch a video of that here), who are both staying in the same condo as I am. From there we stopped by the festival's headquarters to pick up our press badges and do some work. If we're not heading somewhere for food or a screening, we're working wherever we can, inside the nearest warm building. Although it's fast-paced, I still love it, I can't get enough of it. If you haven't already been able to tell (from my years of previous coverage), I love doing high energy, fast-paced full on coverage of festivals and conventions. Just being here gives me the energy I need to keep going. It may sound a lot more depressing than it really is to be working at such a fast pace, but let me remind you, it's just like Disneyland. Sure, there are crowds and people all around, but it's still a fantastic festival no matter what. 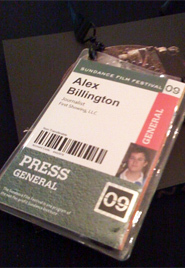 While I haven't been to every film festival, out all of them I have attended, nothing compares to Sundance. Nothing at all. Early festival days like this one are always great because I can actually spend some good time catching up with old friends. In addition to the aforementioned Peter and Neil, I also had dinner with Vic Holtreman of Screen Rant, Kevin Kelly of Spout, Ed Douglas of ComingSoon, and Eric Lavallee of IONCinema.com. All of these six people are not only fellow web journalists, but also good friends, and its partially their company that makes attending this festival so enjoyable. We're all here to see good movies and have a good time. Without them, coming to Sundance certainly wouldn't be the same. It's time to settle in and get the last good nights sleep I'll have for the next two weeks. Tomorrow night it all begins with a screening of Mary and Max, the claymation movie that's opening the festival. That's all that's scheduled, but with more friends coming into town, I'm sure I'll be out catching up with all of them over some beers as well. There is one annual tradition that we will continue to uphold, and that's to get a good first night meal at my own favorite restaurant in all of Park City - Main Street Pizza & Noodle. There is plenty more to come over the next 10 days, so keep checking back in, because it's all only just begun. Lol. I just watched the video on slashfilm.net. It's cool that bloggers from 3 competing movie news sites hang out together for Sundance. Nothing to post regarding this article but to send my condolences to Ricardo Montalban's family. Thank you for your legacy! May you rest in peace. You will be missed! KKKAAAAAAAAAHHHN! im looking forward to all the coverage from your stay at Sundance, the video was well done and entertaining i hope you post more. My dad use to live in Park City and dreaded the season when all you idiots would invade his town. The locals would hunker down and wait til the town was clear of blackberries and coach purses and people playing at the pastoral life. And this from a man who live in NYC for thirty years. I'm glad you're having a good time and plan to enjoy yourself for the next 10 days or so. As someone who lives in Park City year round I plan to leave the house as little as possible. I hate Sundance. It's honestly even worse than the crush of tourists visiting around Christmas. The city is swarmed by entitled "artists" and celebrity hangers on, and locals are shoved out of our restaurants, our bars and our parking spaces. My friends and I are counting down the days until our town is our own again. Here's hoping that Sundance finds some other town to invade in the future.